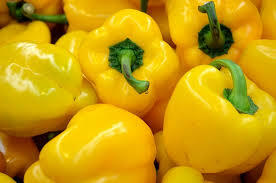 Yellow capsicums achieve their wonderful colour simply because they left on the plant longer before picking. Capsicums, also known as sweet peppers, are closely related to hot chillies, but are sweeter tasting and not hot to eat. They are glossy, smooth-skinned, and blocky (10-12cm long by 6-10cm across). Their thick walls enclose a large hollow and segments which their seeds are attached to.